“Reach for a Lucky” ad, 1930. Courtesy of the Stanford School of Medicine’s SRITA website. 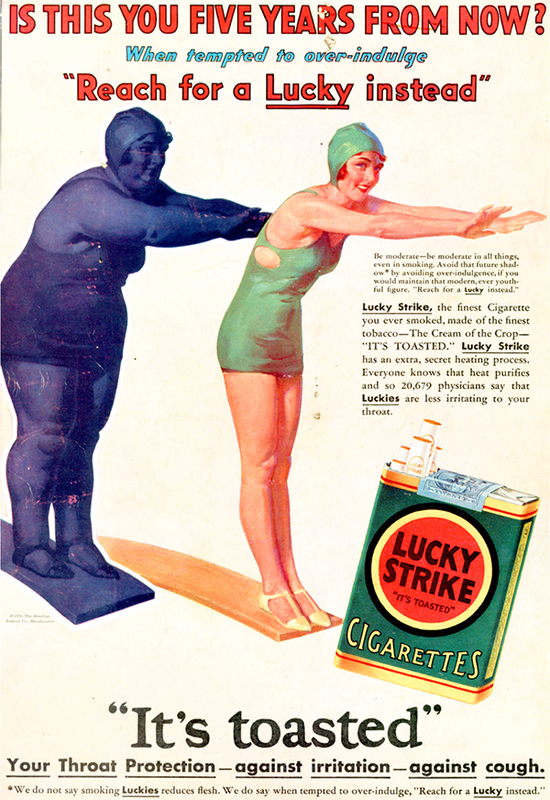 In 1928, the American Tobacco Company began running ads for their “Lucky Strike” cigarettes, specifically targeting women with the tagline “Reach for a Lucky instead of a sweet.” Often featuring thin, attractive women juxtaposed against obese ones, these advertisements pitched cigarettes as a way of guarding against “unhealthy” snacking that might lead to unattractive weight gain. The ads were phenomenally successful. Almost overnight, Lucky Strike cigarettes became the #1 cigarette brand in the United States, their sales increasing 300% in just one year. The percentage of women smokers in America jumped from 5-6% (1924) to 12-16% of women (1929), an increase of at least four million new women smokers. While other cigarette brands had begun targeting women too, Lucky Strike’s unparalleled rise to cigarette stardom implies that their “cigarettes for weight loss” ad campaign had a fair amount of impact. In 1930 Lucky Strike dropped the “. . . instead of a sweet” to appease candy makers, but continued pitching cigarettes as a way to curb overeating. And even after the campaign finally ended, the social destigmatization of women smoking was almost complete. By 1950, nearly half of American women were smoking. Unfortunately, there are no good obesity statistics going back that far, so we’re left simply to wonder whether this “diet” even worked at all. 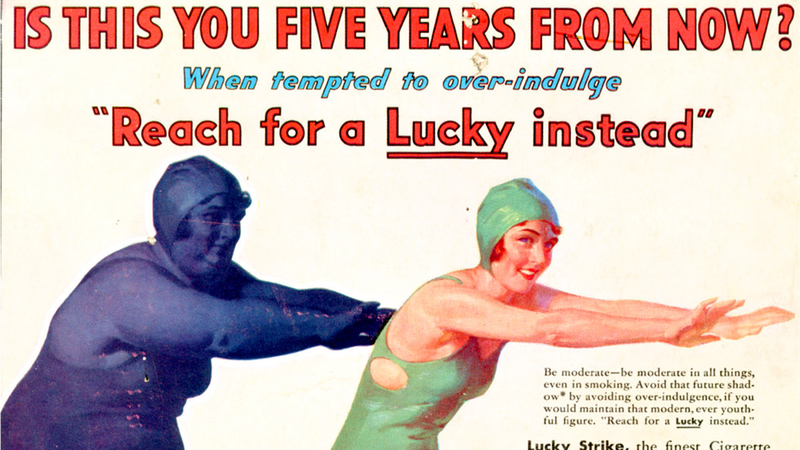 As an interesting footnote, old-school advertising is still boosting Lucky Strike sales, after a fashion. Ever since AMC’s Mad Men made Lucky Strike Cigarettes a top client for Don Draper’s fictional ad agency, Lucky Strike has enjoyed a 50% increase in sales (at a time when other cigarette companies are barely growing at all). “Diet” or no, advertising is still good business for the brand. Next PostNext How Much Money Would It Take To Fill Scrooge’s Money Bin?